Now that that's out of the way, onto the review. 16 year old Nakamura Shiharu is an orphan who loves to take care of children. Apart from those younger than her in the orphanage she is currently living in, she looks after children at her part time job in a nursery, in particular 2 year old twins Aoi and Akane. Did I mention they're adorable? One day the twins are getting ready to be picked up by their uncle, who sees how angelic the kids are with Shiharu and then sort of begs for her to become their babysitter at home. Why? Because he can't handle them. He's a TV announcer/presenter who literally loses his energy when he gets home, so doesn't have time to look after the very energetic twins. So who better than Shiharu, who adores the kids as much as they adore her. And this is where the story begins. 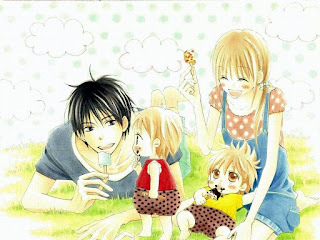 Shiharu's life changes now that she has another job in looking after the twins. Not that it's a bad thing since the twins love being around her, and their uncle is able to relax more around the house. It's a nice way for us to see how the twins grow older and develop different personalities: Akane is the more sociable type and likes to eat; Aoi is the quieter one and is more possessive of Shiharu. The way in which they try to impress Shiharu is adorable, and they learn pretty quickly too. But it's not just about Shiharu and the twins as we see how Shiharu's school life continues on, as well as the twins' uncle in adapting to the new lifestyle. Add in some comedy with a couple of the uncle's friends (one of whom remind me of Ayame from Fruits Basket), and romance and you've got a complete package. And to think this all came from a simple story of a high school girl working a part time job at a nursery, yet it goes much deeper than this as well. Shiharu's past comes to light at some points in the story, not just from her point of view, but from someone who is also in the same orphanage. Matsunaga's (the twins' uncle) past is also told which intertwines with the twins' past of how he came to look after them, in addition to how they each became acquainted with other characters who feature in the Manga. What's more the characters have moments where they think about the future, in particular that of the twins as their lifestyles are about to undergo change which will affect Shiharu and Matsunaga as they're thinking of their futures too. There are times where you know how the story will end with regards to the twins' future and the romance that develops, but since the Manga is still ongoing and in its final arc, you're just left wondering how it will end. I was quite upset with the fact that the story had developed so much yet no more chapters had been translated, and that the author mentioned in the Manga that the story will end soon. It's a must read in my opinion, with a pace that is just right, not taking too long to unravel different events and how they affect the story, and not too fast so it misses things out. Love So Life is a great story with a great mix of characters, but it's sad to see such a good story end so soon with only 97 chapters currently translated online. You'll want to know how the twins develop in the future, but it doesn't look like it will go that far, and at the same time wanting to know of other developments which could go either way depending on how much longer the author wants the story to go on. It's highly recommended guys, so check it out!